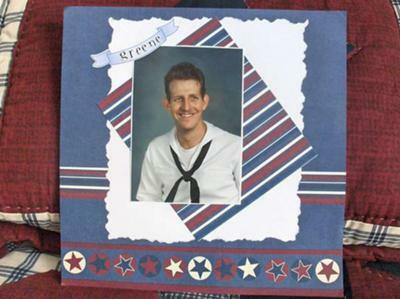 Navy Scrapbook Layout - My Husband is my Hero! When people meet my husband they sorta step back and look up and say "wow your tall". And he is, as he stands 6'5. His height makes him seem like this big ruff n tuff sorta guy, but when you get to know him, he is really a big teddy bear! He has the most caring heart. When something gets me down, I can go to him for full support. When he reaches out to hug me with his big strong arms, I then feel like everything will be just fine! While he was in the US Navy he was a supervisor, and I am sure they looked up to him as well. I can honestly say, my Husband is my Hero! Comments for Navy Scrapbook Layout - My Husband is my Hero! I like the Traditional Red, White and Blue on this layout as well as the torn edges and angles of the photo mattes. This is really nice. Join in and write your own page! It's easy to do. How? Simply click here to return to Military Scrapbook Layouts - Navy.